New laws for using a mobile whilst driving. Increased measures have been taken by both the Government and the police to detect and prosecute drivers who are caught using a handheld mobile device while driving, with the aim of reducing deaths and injuries on the road, and improving road safety. Mobile phone use was a contributory factor in 22 fatal and 75 serious road accidents in 2015 and was revealed as one of top four public concerns for road safety in a 2016 UK Government survey. This factsheet outlines the new penalties and recommends the approach for employers to take with immediate effect. The offence itself has not changed – just increased penalties. From 1 March 2017, the penalties have increased for drivers caught using a handheld mobile device while driving. Both the fine and penalty points will double: from £100 to £200 and from 3 to 6 points. New drivers are particularly impacted because if they get just 6 points in the first two years after passing their test, they will lose their licence. More experienced drivers could go to court if they offend more than once, potentially facing fines of up to £1000 and a minimum 6-month driving ban. If convicted, driving licences will show the offence for four years and this would have to be declared to insurers. SCOPE: WHAT IS COVERED UNDER THE LAW? The law applies to all vehicles including motorcycles and includes holding a phone to read a text or email, check social media, take a photo or use any other function or feature. It states that it is only acceptable to use your phone in a vehicle if you need to call 999 in an emergency and it is unsafe or impractical to stop, or if you are safely parked and your engine is turned off. 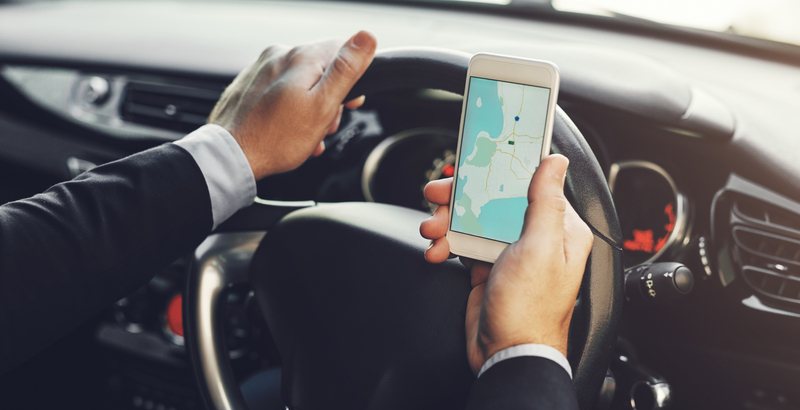 It’s important to note that the legislation does not only apply to mobile phones but to any handheld device where it is seen to be that the driver’s attention is distracted from the road, including when using a satellite navigation device. This pertains even if you have stopped at traffic lights or are queuing in traffic. The relevant law in question is The Road Vehicles (Construction and Use) (Amendment) (No. 4) Regulations 2003, a link to which is included below: http://www.legislation.gov.uk/uksi/2003/2695/pdfs/uksi_20032695 Employers should note that it is an offence to “cause or permit” a driver to use a handheld mobile phone while driving. Therefore, employers can be held liable as well as the individual driver if they require employees to use a handheld phone while driving. It can be illegal to use a hands-free phone while driving. Depending upon the individual circumstances, drivers could be charged with ‘failing to have proper control of their vehicle’. Research has demonstrated that using a hands-free phone while driving does not significantly reduce the risks vs a handheld phone. This is because the problems are caused mainly by mental distraction and divided attention of taking part in a phone conversation at the same time as driving. Typically the evidence from police will involve a description of some kind of interaction (observed or detected with technology) with a handheld mobile telephone, for example typing on the screen, talking into the phone etc. Police forces have stepped up activity to enforce the law, and while physical observation is the main method of detecting the offence, an increasing range of technology is being developed to aid law enforcement activity. Health and Safety Executive (HSE) guidelines for employers, ‘Driving at Work’, state that “health and safety law applies to on-the-road work activities as to all work activities and the risks should be effectively managed within a health and safety system”. Therefore, employers must assess the risks involved in their employees’ use of the road for work and put in place all ‘reasonably practicable’ measures to manage those risks. This includes managing and communicating to employees all risks from driving at work. Ownership of the vehicles is irrelevant and this includes driving older, privately owned vehicles (often referred to as ‘grey fleet’) which may not have Bluetooth connectivity. It would also include driving a rental vehicle where there is no Bluetooth connectivity. WHAT ACTION SHOULD EMPLOYERS TAKE? Employers must review company car and driving at work policies and ensure that there is clear guidance for mobile phone use. This should include mechanisms for ensuring that employees and/or their safety representatives are fully consulted about the organisation’s policy on mobile phones and driving and that this is reviewed periodically. The policies can range from a complete ‘engine on, mobile off’ policy to comprehensive guidance on limited use on accepting calls on Bluetooth connected phones. For example: In particular, emphasise that employees should never make or receive calls, send or read texts or emails or surf the internet on a mobile phone, or any similar device while driving. Employees could face disciplinary action for not complying with company policy as well as any police prosecution. When driving put the mobile phone settings onto ‘automatically go to voicemail’ with a suitable message, or to switch the phone off while driving, and to stop in a safe place to check messages. Review work practices to ensure that line managers do not pressurise or encourage employees into making or receiving calls when driving. A good example of managers ‘causing and permitting’ an offence is expecting an employee to join a conference call when they are driving. Senior managers, from the head of the organisation down, should lead by personal example by not using a mobile phone while they are driving themselves. Ensure that journey plans include time and places to stop for rest and refreshment and to check messages and return calls. If you have any questions or require further information, please speak to your Adept Vehicle Management account management team who will be pleased to help. Governments across Europe (mainly the UK) damage the last decade of successful vehicle Co2 reduction by forcing drivers to move from diesel to petrol? Our latest customer survey results are in. We are delighted to have been awarded ISO 9001 certification.